Ahoy, mates! 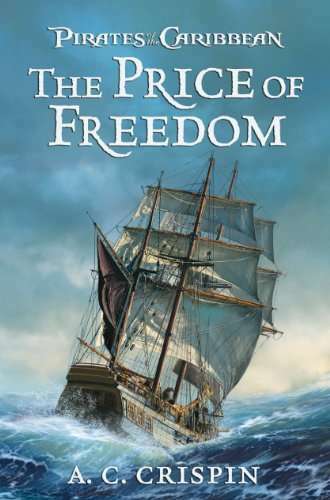 In conjunction with today’s opening of the film Pirates of the Caribbean: On Stranger Tides, Disney Book Group just published a Pirates of the Caribbean novel titled The Price of Freedom. Written by A.C. Crispin, this 600-plus page yarn provides a back story for everyone’s favorite pirate: Captain Jack Sparrow. Twenty-five-year-old Jack has given up his boyhood exploits as a pirate for a legitimate career as first mate on an East India Trading Company ship, but a swashbuckling adventure typical of the Pirates movie franchise tempts Jack back to the pirating business. Along the way Jack encounters major players of the first three films, including his nemesis Lord Beckett of the East India Trading Company, his rival Captain Barbossa, and his father Captain Teague (portrayed in the films by Keith Richards). Perhaps most interesting to us landlubbers is the lengthy tome’s explanation of how young Jack Sparrow became the crazed Captain we know and love: how he acquired his ship The Black Pearl, became indebted to Davy Jones, and got his red bandanna, the brand on his arm, and his signature dreadlocks. If you can’t get enough of Jack after seeing the new film, be sure to check out this origins story. Savvy?